By the 1960s, however, a reluctant acceptance that Britain had to change had set in. Post-imperial Britain was no longer as powerful on the world stage, and we grudgingly accepted that it was time to seek ore than a stand-off role in Europe. Whether the British Empire was as glorious as its proponents claim is a very open question, but it is possible to think of a time when the UK and the US were equals. 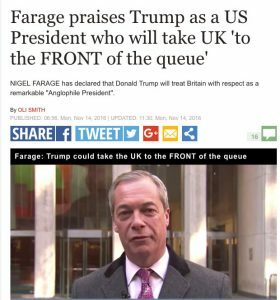 Farage’s confidence in a special link with Trump is redolent of those times. But in leaving the EU, the UK does drop down the league table. We face being greatly weakened. We are far from any illusion of equality with the US. If penalising the NHS meets Trump’s campaign promise to put “America First” it will happen. What this unseemly episode shows is Britain (or at least, its Faragist / Brexiteer streak) risking future on idealised fantasies of the past. It’s no wonder that some civil servants have disparaingly dubbed the vision of multiple trade deals as “British Empire 2.0”. 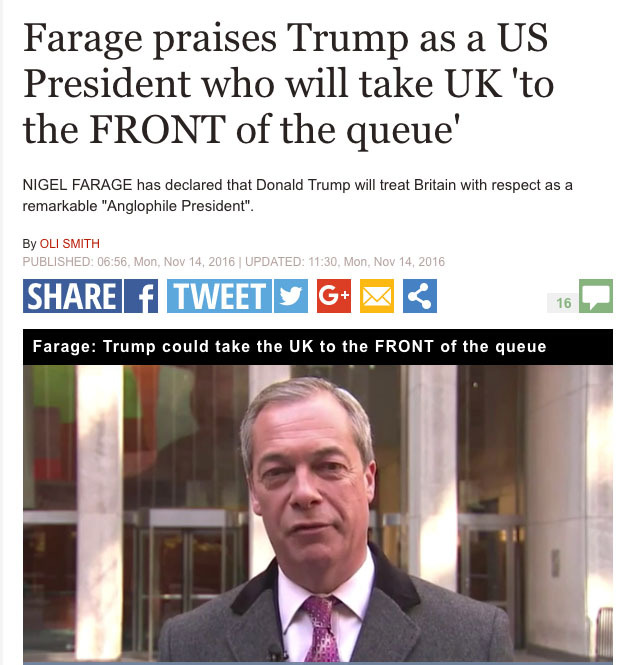 In being so wrong, Farage has demonstrated (again) that the UK’s most important friends lie across the Channel, not across the Atlantic (or in the former colonies which we treated badly).